When the series started it tended towards the offbeat and the eccentric, mining that slightly detached country life where some things hadn’t changed in centuries. Directed with panache and utilising the cream of television actors the show was individual enough to stand out, strange enough to appeal to some people who’d never watch a police show yet safe enough to be enjoyed by pretty much everyone. Inevitably as the episodes stacked up standards have wobbled even though both direction and acting remain impeccable. The way television drama has developed over the past decade has made this show seem sluggish at times and some of the plots have not been intricate enough to stretch across the generous running time. Yet just when you think it’s as dead and buried as its many victims along comes something good. The change of lead actor has been one refreshing recalibration. John Nettles was perfect for the show for a long time but his latter day presence had become so wispy that he seemed to tread about the villages like a ghost; in real life he would have retired from policing some time ago. His cousin John on the other hand is played with a wry touch by Neil Dudgeon who brings a little psychology to proceedings. His dog is Sykes while his latest sidekick is called Nelson so it remains traditionally British alright but – whisper it – after the great ethnicity controversy of 2011, the series now includes some non white characters. More fundamentally it has tweaked its agenda so that the best episodes now weave the mystery around a central theme more effectively. The murders may still be gruesome and bizarre- this one includes a corpse sealed into a shipment of boxes – but more thought goes into tying up issues. Paul Logue’s episode deals with the murder of businessman Eric Calder from Badger’s Drift the locale of the very first episode. He is despatched by strychnine on a tin of his company’s own famed biscuits while he’s in Copenhagen ostensibly on business but it seems he was in the process of selling the company. It soon becomes clear that both places are wrapped up in the case thus Barnaby has to liaise with his Danish counterpart Birgette Poulsen initially via some stony phone calls in which she does not seem impressed with, as she later refers to them “English bobbies”.. The plot eventually contrives to take Barnaby to Denmark the very week Mrs Barnaby is due to give birth. The script offers plenty of notes about the differences between men and women; from gags such as seeing John labour over the construction of a cot, after which pathologist Kate Wilding runs it up in no time to the overall story which is driven by affairs and secrets amongst the family. The quartet of Barnaby and Nelson on the one hand and Poulsen and her deputy Anna Degny on the other plays well into the episode’s themes but is relatively gentle; the slight smiles soon betray a mutual respect is always nearby. We don’t see that much of Copenhagen really though what we do see includes an impressive exterior of the police headquarters. 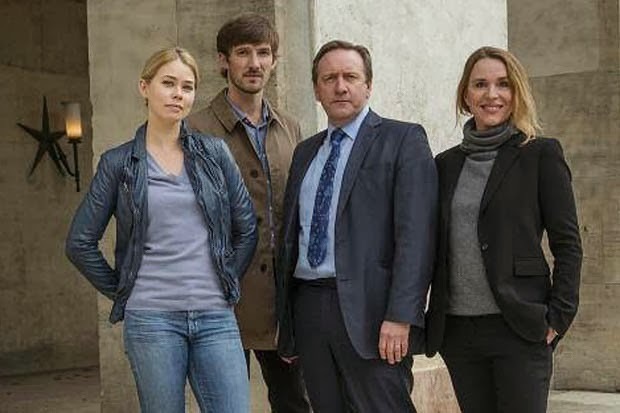 The look is clean and clinical though of course less sombre than the now popular Scandinavian police series and there isn’t a chunky jumper in sight. That the case hinges on the recipe of a famed biscuit called Golden Clusters (which sounds more like a chocolate) is typical Midsomer Murders. The episode delivers a strong climax involving the Victorian looking factory floor (steam belching everywhere! ), a conveyer belt and an oven that looks like its full of lava! Of course it’s great though the relatively small cast means we’ve guessed the identity of the killer simply because it couldn’t really be anyone else. The typically strong guest stars include Sanjeev Bhaskar as a self promoting biscuit maker sporting a jacket straight out of Willy Wonka, Nicholas Jones and Richard Cordery as two scheming house clearance brothers, The Thick of It’s Joanna Scanlon, Jonathan Barnwell Ripper Street’s unfortunate PC Hobbes as Eric’s son, Caroline Goodall as the Calder’s less than sad widow Penelope and Adrian Lukis relishing his part as Eric’s unprincipled brother.. Perhaps deliberately Jones, Lukis and Goodall have all appeared in different roles in the show before; for Cordery this is his third run out. Some people mock Midsomer Murders or compare it unfavourably to darker, edgier series but surely we should have a variety of dramas on television and quite frankly I’d rather watch this than two hours of Vera edging even more slowly towards a conclusion in the bleak weather or DCI Banks wincing at every development. Here’s to another one hundred episodes! *Yes, of course he will. It’s a girl and they’re calling her Betty. Betty Barnaby. Fast forward 23 years and ITV’s new series Betty Barnaby Beats the Baddies. Can anyone tell me the location of the actual "biscuit factory" which looks more like a 1920's power station?